Leading Dutch beer goes back to basics with a functional new look. It's turning out to be quite the week for beer branding. Yesterday we revealed Carlsberg's self-effacing new campaign, admitting that it probably wasn't actually the best lager in the world, and repositioning itself as a hip new pilsner. And now Grolsch has unveiled its own rebrand – and it's also now describing itself as a pilsner. We're guessing that lager has become tragically uncool. The rebrand is the work of freelance graphic designer Dan Lawrence, and at first glance you might mistake it for one of those redesigns that doesn't actually change very much, but in fact it's been given a thorough work-over that concentrates on the brand's essentials. 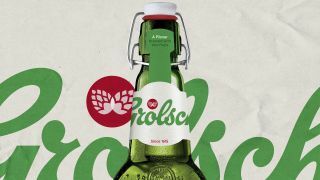 Like many venerable brands - the Grolsch brewery was founded back in 1615 - Grolsch has been refreshed many times over the years, and its new owners, Asani, felt that its originality and brand story had been lost along the way. Lawrence's job, then, was to bring back Grolsch's traditional values and express its sophisticated but unconventional approach to beer. He approached this brief by stripping out everything from the Grolsch branding that served no purpose, and you can see this in the flat wordmark and a new, minimal logo design that still illustrates the fact that Grolsch is brewed using two different hops, but in a much less fussy way than in previous iterations. There's also the bare typographical minimum on the packaging, using a simple sans-serif and highlighting key messaging. It's not completely minimal, though; a little extra visual interest comes from the use of raw materials in the packaging, and we also like the way that the Grolsch wordmark is sized and positioned so that the edges of it are always cut off in some way, no matter how you look at it. It's a similar approach to the one Kellogg's has recently taken with its newly redesigned cereal boxes; we suspect this is becoming a bit of a trend. To take a closer look at Dan Lawrence's Grolsch rebrand, head over to his site.